Did Dahiru Mangal Kill The Nigerian Textile Industry? In the mid-1980s Nigeria had 175 textile mills. Over the quarter-century that followed, all but 25 shut down. Many of those that have struggled on do so only at a fraction of their capacity. Of the 350,000 people the industry employed in its heyday, making it comfortably Nigeria’s most important manufacturing sector, all but 25,000 have lost their jobs. Imports comprise 85 per cent of the market, despite the fact that importing textiles is illegal. The World Bank has estimated that textiles smuggled into Nigeria through Benin are worth $2.2bn a year, compared with local Nigerian production that has shrivelled to $40m annually. A team of experts working for the United Nations concluded in 2009, “The Nigerian textile industry is on the verge of a total collapse.” Given the power crisis, the near-impassable state of Nigeria’s roads and the deluge of counterfeit clothes, it is a wonder that the industry kept going as long as it did. The knock-on effects of this collapse are hard to quantify but they ripple far into the Nigerian economy, especially in the north. About half of the million farmers who used to grow cotton to supply textile mills no longer do so, although some have switched to other crops. Formal jobs in Nigeria are scarce and precious. Each textile employee supports maybe half-a-dozen relatives. It is safe to say that the destruction of the Nigerian textile industry has blighted millions of lives. 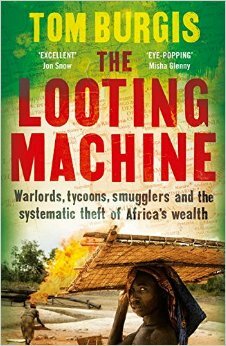 I am currently reading Tom Burgis’ The Looting Machine from where I have taken the quote above. (Actually, the quote above is from an excerpt of the book published recently in the FT. Find it here). The author spent 9 years across Africa as a reporter and this book is the result of the things he learnt. So far, it’s quite a remarkable, if terribly depressing, read. It is one thing for a country to lose an industry making say, compact disc players – at least you can say that technology rendered that product almost completely obsolete and killed demand for it along with the industry. But why lose a textile industry? It’s not as if clothes have gone out of fashion – the market is worth $2.2bn of illegal imports yearly! Even more annoyingly, the textile industry remains one of the most labour intensive in the world today. It is also not very capital-intensive compared to other industries – an American study from some years ago estimated that oil and gas companies spend $3.2m per employee in terms of investments. In comparison, the textile industry spends around $13,000 per employee. I used to hear the name Dahiru Mangal especially during the Yar’Adua administration but the full-scale of his economic destruction only came to me while reading this book. To put it in Nigerian parlance – he is into smuggling. He denies this of course, saying he merely provides a logistics services. In the shadier corners of the workshop of the world Mangal found the perfect business partners. “The Chinese attacked at the heart of the industry: the wax-print and African-print segment,” a consultant who has spent years investigating — and trying to reverse — the slow death of Nigerian textiles explained to me. During the 1990s Chinese factories began copying west African designs and opening their own distribution branches in the region. “This is 100 per cent illicit — but the locals do the smuggling,” the consultant went on. There are, he said, 16 factories in China dedicated to churning out textiles with a “Made in Nigeria” badge sewn into them. For a time the Chinese material was of a much lower quality than Nigerian originals, but that gap narrowed as Chinese standards rose. The Chinese began to take control of the market, in league with Nigerian vendors. Mangal acts as the facilitator, the conduit between manufacturer and distributor, managing a shadow economy that includes the border authorities and his political allies. Like many others who profit from the “resource curse”, he plies the hidden byways of the globalised economy. From his base in Katsina, Mangal arranges the import of food, fuel and anything his wealthy Nigerian clients might desire. But the staple of his operation is the textiles that have helped kill off the local industry. The details of the alleged smuggling operation are drawn from interviews with northern Nigeria politicians, officials, businessmen and textiles consultants in Abuja, Katsina, Kano and Kaduna between 2009 and 2013. Mangal is said to charge a flat fee of N2m (about $13,000) per cargo, plus the cost of goods. In 2008 Mangal was estimated to be bringing about 100 40ft shipping containers across the frontier each month. Mangal goes to China to buy materials, pays workers, produces clothes, puts them in a container, ships them to a neighbouring country, bribes customs officials, smuggles them across the Nigerian border and still gets it to the Nigerian customer at much cheaper prices than something produced on their doorstep. It’s a different thing when someone brings in something not produced in the country like iPhones. But to be so comprehensively attacked and destroyed at your own game in this way is quite sad and worth reflecting on. Dutch Disease is a pandemic whose symptoms, in many cases, include poverty and oppression. The disease enters a country through its currency. The dollars that pay for exported hydrocarbons, minerals, ores and gems push up the value of the local currency. Imports become cheaper relative to locally made products, undercutting homegrown enterprises. Arable land lies fallow as local farmers find that imported fare has displaced their produce. For countries that have started to industrialise, the process goes into reverse; those that aspire to industrialise are stymied. Processing natural commodities can multiply their value four hundredfold but, lacking industrial capacity, Africa’s resource states watch their oil and minerals sail away in raw form for that value to accrue elsewhere. Once the oil money starts to enter a country, the local currency comes under pressure and starts to appreciate. Note, this does not mean that currency’s value visibly rises from say N2 to $1 to N1.50 to $1. Instead, the currency is always trading above its real value. So even if the exchange rate is N150 to $1, it might be the that the real value is actually N200 to $1. Using those numbers, imagine that it costs $5 to make a t-shirt in China. It can sell for N750 in Nigeria at the overvalued exchange rate. But in reality, if the exchange rate was at its real level, it should sell for N1,000 which will obviously make it less competitive in the local market. Naturally, the Naira should be at its real level to at least make it harder for cheap imports to gain a foothold in the market. It also means that if Nigerian textile makers decide to export their products, they will get more Naira for it. This is obviously good as the local market is protected against cheap imports while making exports attractive at the same time. But those dollars flowing into the economy from oil sales make it very hard to keep the currency at its real level or even undervalued. When the dollars come in, they need to be turned into Naira to be useful. Fighting this pressure on the Naira is by no means easy but neither is it impossible. Yorubas says that if you are not going to eat something, you shouldn’t bring it near your nose. If you don’t want the disease that this kind of money brings into an economy, best thing is to park it abroad. You will agree that this is completely out of the question for Nigeria right now. We are so addicted to oil that grown men will burst into tears if their monthly allocation from the Federal Government is reduced. Worse, few states have any clue what to do to develop an economy that can pay its way via taxes as a recent CBN report showed – in aggregate, internally generated revenue across the states did not increase between 2013 and 2014. But there is another way perhaps. The U.S. pledged to monitor China’s “undervalued” yuan in the next three months for signs that Asia’s fastest-growing market is living up to its commitments to help rebalance the global economy. China took a “significant step” last month when it ended its peg to the dollar and allowed markets to drive the currency higher, the Treasury Department said yesterday. The report, initially due April 15, concluded that no major U.S. trading partner manipulated its currency and said it’s not yet clear whether China’s policy shift will correct the yuan’s undervaluation. The Treasury promised another review in October. China’s reserves rose to a record $2.447 trillion in the first quarter of 2010, according to the People’s Bank of China. Holdings jumped $22.5 billion in March, after gaining $9.4 billion in February and $16 billion in January, data posted on the central bank’s website in April showed. They are doing pretty much the same thing the Norwegians are doing – re-routing the dollars into their reserves instead of the local economy and thereby keeping manufacturers and exporters competitive. To paraphrase Winston Churchill – You can always count on Nigerians to do the right thing – after they have tried everything else. According to the book, Obasanjo dispatched Nasir El-Rufai to try to stop Mangal’s smuggling. Mangal claimed he was merely providing a logistics service for people (illegally) importing clothes. Nothing came of it. The next thing to do of course was to provide ‘intervention funds’ for the industry. Just before leaving office in 2007, Obasanjo ‘launched’ a N70bn Textile Development Fund. This was meant to revive the industry and create the usual 1 billion jobs bla bla. President Yar’Adua didn’t scrap or probe the fund (perhaps because it was merely launched under Obasanjo) but went ahead with it. He ‘appealed’ to Nigerians to be ‘patriotic’ and buy local textile as those industries were suffering due to ‘lack of demand’. He then went on to increase the size of the fund by an extra N30bn to N100bn. In 2002, Obasanjo banned the import of textiles. By 2010, Goodluck Jonathan’s government decided it had had enough and lifted the ban. Clearly it hadn’t worked (except you were Mangal of course) and Aganga announced at the time that it was only encouraging corruption so the ban was to be replaced by tariffs. Goodluck Jonathan continued with the Textile Development Fund and as at February 2013, 38 companies had benefited from the fund saving a massive 8,000 jobs and creating 5,000 new ones as a result. By the end of last year, the fund had disbursed N60bn in total and had even been renamed National Cotton Textile and Garment Policy (Aganga likes calling things ‘policy’). Of course, the military and government agencies were ‘directed’ to purchase made in Nigeria fabric as usual. Naturally, those who managed to benefit from the loan hailed the policy as the best thing to happen to textile in Nigeria, ever. This is all very sad indeed. The funds have apparently been converted into equity by the government which means the industry does not have to worry too much about crippling interest rates. Yet, N60bn has been thrown at the problem to save 8,000 jobs. The first and obvious lesson here is that prevention is better than cure – one shouldn’t really wait for an industry to die before then attempting to ‘revive’ it. Once those jobs go, bringing them back is very hard even when you have the sharpest policy makers running things (we don’t). No serious country should allow a guy like Mangal lay waste to a whole industry and livelihoods without so much as a response. Of all the things that damaged the textile industry, Mangal was almost certainly the easiest to deal with – just make it uneconomical for him to ship stuff halfway around the world and still make a profit. Everything has now been tried – banning, unbanning, intervention funds, tariffs, mandating government purchase – without much success. If the aim of what China and Norway have been doing is to stop their currencies from appreciating, then it becomes fairly obvious that keeping manufacturing competitive in Nigeria is as much a monetary policy issue as it is a fiscal policy one. What to do becomes fairly obvious. But me I don’t want you people’s wahala so it is not from my mouth you will hear that the Naira needs to be deva…oh look at this big red elephant! Just to put part of what you have said into context….someone once said “”A $100 bar of raw iron is worth $200 when forged into drinking cups in Africa, $65,000 when forged into needles in Asia, $5m when forged into watch springs in Europe.”…..any country that really wants to grow the economy quickly must manufacture,that is the power of manufacturing. I once passed through the checkpoint-laden Road from Jibia Border. Noticed it was empty of cops… Was shocked to hear that that Tuesday was Mangals day (of imports). All customs agents clear Road! Funny part is when free-riders join his band wagon, Mangal spies point exactly where they offload in, mostly, Kano markets. No guessing who owned those seized textile products Customs staged for burning. Wonderful Naija! I know of someone who worked with Cotecna when the did a brief stint of managing the inspections process at the Katsina border, he told me all the security agents at the borders turn a blind eye to all forms of smuggling as long as you drop a token which sometimes is as low as N200. Once it is 5pm closing time they shut down the scanning machines and miraculously the Mangal trucks begin to appear, by this time they have to do “manual” scanning. Even illegal aliens do not pay up to N1000 to get passage into the country through this border. I wonder what else is in those trucks… Soviet era tanks? A couple of grenade launchers? Amazing revelation here mehn! Love every bit of the write up. Our Present Leadership cant/wont and don’t have the sincere will and capacity to make things happen for us. Its soo bad! Need to brush up my economics asap. Suppose we cannot even follow the Norwegian/Chinese approach, how does Bangladesh manage to do it while maintaining a relatively worse macroeconomic profile than Nigeria? The regulatory/policy attitude towards enterprise in Nigeria is puzzling. Things made in Nigeria but not by Nigerians are still local! may Allah protect you and help you all the times in life, Allah ya daukaka Engr Fahad dahiru Mangal amin.